Bob Ebeling, Challenger Engineer Who Warned Of Shuttle Disaster, Dies : The Two-Way Bob Ebeling was one of five booster rocket engineers at a NASA contractor who tried to stop the 1986 launch of the space shuttle Challenger, which exploded 73 seconds into its flight. He was 89. Bob Ebeling with his daughter Kathy (center) and his wife, Darlene. "It was as if he got permission from the world," says his daughter Leslie Ebeling Serna. "He was able to let that part of his life go." 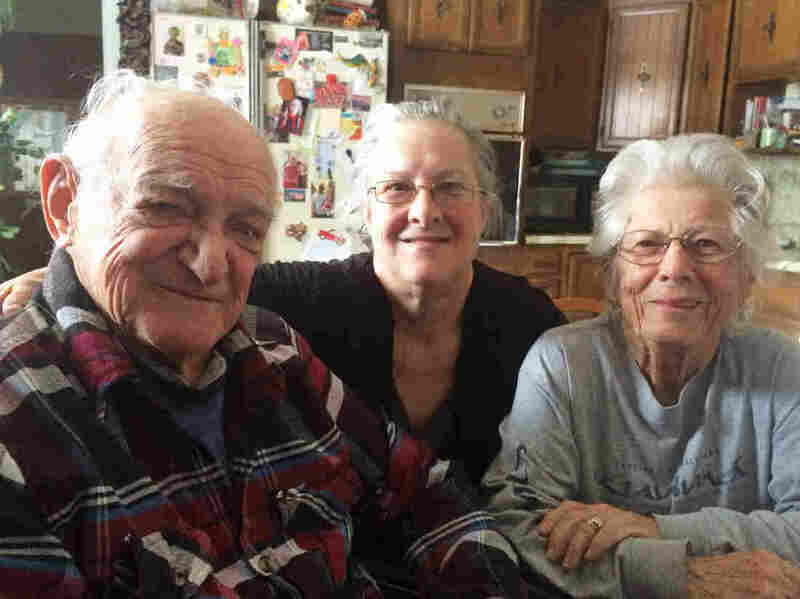 Ebeling died Monday at age 89 in Brigham City, Utah, after a long illness, according to his daughter Kathy Ebeling. Hundreds of NPR readers and listeners helped Ebeling overcome persistent guilt in the weeks before his death. They sent supportive emails and letters after our January story marking the 30th anniversary of the Challenger tragedy. "We all knew if the seals failed, the shuttle would blow up," said engineer Roger Boisjoly in a 1986 interview with NPR's Daniel Zwerdling. Ebeling was the first to sound the alarm the morning before the Challenger launch. He called his boss, Allan McDonald, who was Thiokol's representative at the Kennedy Space Center in Florida. "If you hadn't called me," McDonald told Ebeling, "they were in such a 'go' mode, we'd have never been able to stop it." Ebeling helped assemble the data that demonstrated the risk. Boisjoly argued for a launch delay. At first, the Thiokol executives agreed and said they wouldn't approve the launch. "My God, Thiokol," responded Lawrence Mulloy of NASA's Marshall Spaceflight Center. "When do you want me to launch? Next April?" Despite hours of argument and reams of data, the Thiokol executives relented. McDonald says the data were absolutely clear, but politics and pressure interfered. "I think that was one of the mistakes God made," Ebeling told me in January. "He shouldn't have picked me for that job." The morning of the launch, a distraught Ebeling drove to Thiokol's remote Utah complex with his daughter. "He said, 'The Challenger's going to blow up. Everyone's going to die,' " Serna recalls. "And he was beating his fist on the dashboard. He was frantic." Serna, Ebeling and Boisjoly sat together in a crowded conference room as live video of the launch appeared on a large projection screen. When Challenger exploded, Serna says, "I could feel [Ebeling] trembling. And then he wept — loudly. And then Roger started crying." Three weeks later, I sat with Ebeling at his kitchen table, tears and anger punctuating his words. He didn't want to be recorded or named at the time. Both he and Boisjoly, who died in 2012, became NPR's anonymous sources in the first detailed account of the effort to keep Challenger grounded. "That's my engineering background coming out," Ebeling explained three decades later. "Somebody should tell ... the truth." Ebeling retired soon after the Challenger disaster. He used his engineering expertise and what he proudly called his love of ducks to help restore a bird refuge near his home that was damaged by floodwater from the Great Salt Lake. In 1990, President George H.W. Bush presented Ebeling with the Theodore Roosevelt Conservation Award. But that work didn't diminish lingering pain and guilt. God "picked a loser," Ebeling said in January, thinking back to his role in the Challenger launch. Then Ebeling heard from hundreds of NPR readers and listeners, who responded to our January story. "God didn't pick a loser. He picked Bob Ebeling," said Jim Sides, a utilities engineer in North Carolina. "Bob Ebeling did his job that night," Sides continued. "He did the right thing, and that does not make him a loser. That makes him a winner." And NASA sent a statement, saying that the deaths of the seven Challenger astronauts served to remind the space agency "to remain vigilant and to listen to those like Mr. Ebeling who have the courage to speak up." The burden began to lift even as Ebeling's health declined. A few weeks before his death, he thanked those who reached out to him. "You helped bring my worrisome mind to ease," Ebeling said. "You have to have an end to everything." Bob Ebeling is survived by his wife, Darlene, and 35 descendants spanning four generations, including a grandson studying engineering and granddaughter Ivy Lippard. Lippard joined NPR readers and listeners in posting a message about her grandfather on our website. Lippard described Ebeling as a man "full of integrity" with a "legacy of compassion." "It's an honor," she wrote, "to be able to pass down his legacy."